With 200 million monthly active Pinterest users, there’s no doubt it’s a powerful social network for marketing, especially if your main target audience is women, since 80% of Pinterest users are women. And to make sure you make the most out of your Pinterest marketing efforts, here are 6 common mistakes to avoid. In other words, not adding a properly sized, profile picture when using Pinterest for marketing. Profile pictures should be 165 x 165 pixels to fit perfectly. When it comes to choosing your profile picture you have two choices. Either a head shot of you if you are the face of your brand, like Tony Robbins for example. If that’s the case, make sure your profile picture is not cropped, is not a selfie, is not pixelated or make sure it doesn’t have a messy or busy background as it can make you come across as unprofessional. Instead, put a close up picture of you, head and shoulders ideally, facing the camera and smiling. The second option when using Pinterest for marketing is to put a logo as a profile picture if you are not the face of your brand, like Starbucks or Nike. In terms of dimensions, the same applies, 165 x 165 pixels. Then, make sure you add a bio that underlines who you are, what you do, how you help people and who you help. The next step to optimize your Pinterest account is adding your website URL or any URL you want your Pinterest followers to visit, such as your Youtube channel or your other social network accounts. If you’d like to take your Pinterest marketing to the next level, and increase the results you’re getting from your current Pinterest marketing efforts considerably, click here to download my special FREE Pinterest report. Simply enter your name and email and I’ll instantly send it to you. When you use Pinterest for business, make sure your username is user-friendly. It should be easy to spell and easy to remember to make it easier for people to remember and find you on Pinterest. Plus, your username should not exceed 15 characters. Your username could be your first and last name if you are the face of the brand as long as it’s not already taken. Or it could be a keyword rich username such as: pinterest.com/organicskincare. The second mistake to avoid with Pinterest marketing is not pinning on a regular basis. If you’ve decided to market on Pinterest you’ll have to commit to publishing pins regularly, once a day or at least a few times a week. If this sounds tricky, then we recommend using tailwindapp.com. This tool allows you to schedule pins in advance. Simply click on “publisher” and then click on “create new pin”. 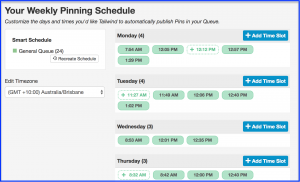 Plus, this tool already shows you when are the best times to schedule your pins for, to increase the chances of your pins being seen by your Pinterest followers. The third mistake to avoid when using Pinterest for business is not creating engaging pins. Pins that are either irrelevant to your audience, or are not informational. Ideally, when you use Pinterest for business, your pins should be 735 pixels wide and 1,102 pixels long. To come up with ideas for engaging pins to publish for your Pinterest followers, type in the search box, keywords relevant to your business and look at the most popular pins and try to model them. The more engagement they have received the more popular they are. The fourth mistake to avoid with Pinterest marketing is not optimising your Pinterest boards. Pinterest boards are the equivalent of folders to categorize your pins. To create boards, simply go to your profile, then click on boards and then click on “create boards”. When optimising your boards, it’s important they have a keyword rich title. For example, when you use Pinterest for business, avoid naming your board “things I like”. Instead, be more specific, for example, your board title could be “easy vegan dinner recipes”. To get ideas for attention-grabbing board titles, perform a search on Pinterest. Simply type in a keyword relevant to your business in the search bar, then click on boards. There you’ll see all the board titles which include your keyword. 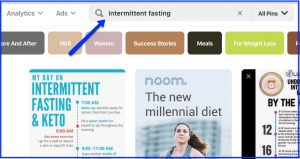 Then, make sure you add a keyword rich description for your board, such as “Discover over 100 vegan dinner recipes that require no more than 20 mins to prepare and serve up to 4 people for under $10”. Remember to also create a board cover. Your board cover should be an image with the title of your board so it stands out from other boards. Then, reshuffle your boards by dragging and dropping them to make sure your most popular pins appear at the top of your profile. The fifth mistake to avoid when using Pinterest for business is not tracking. When you have a business Pinterest account, you can access Pinterest analytics to discover information about your audience and your pins, so you can do more of what works and less of what doesn’t. You can access more detailed Pinterest analytics within Pinterest when you confirm your website. Simply click on “confirm website” and follow the prompts. You can track even further by using tools such as clickmeter.com which tracks how many clicks your links are getting. To track how many email subscribers you’re getting, access the analytics in your autoresponder system. For example, with Infusionsoft, an email autoresponder system, you can easily see how many new subscribers each of your campaigns has gotten you. When using Pinterest for business, each pin should have a keyword rich title and a keyword rich description. Avoid naming pins with broad, generic keywords such as “gift ideas”. Instead, be more specific. For example, you can name your pin “gift ideas for men over 40”. To come up with keyword rich pin names, type your keyword in the search bar and see what keywords Pinterest suggests. Or, check other pins for title ideas. The more specific your keyword is, the more likely your pin will show up at the top of the search results.